I'm not one to make resolutions as I can't stick to something for a year, well honestly I've never tried but giving up chocolate for lent each year physically pains me and that isn't a year long and I basically just about get through that! However this year is different as I do want to make resolutions but more so for this blog. When I started this blog I never expected anybody to read or even comment on it and to see people do that really puts a smile on my face. Honestly when it comes to photography I have no clue what I am doing and basically just pick up the camera and press a button. This year I want to actually learn how to use it to get the best out of it as possible. Backgrounds are also something I struggle with as I have ideas in my head that well in my head they're such a great idea but then when I go to carry them out they are a complete flop. So I'm hoping I'll find a solution to that. I'd really love to do more fashion posts, even if they are just a quick OOTD but I really enjoy reading these kind of posts so I want to attempt to do a lot more this year. Definitely something I want to do more this year is take part in the twitter chats, I am dreadful when it comes to remembering times for these so I'm definitely going to jot down the days and times for them. It seems like such a great way to find bloggers and just enjoy having a chat about certain topics for an hour or so. Definitely one of the main things I want to do this year is host a giveaway ft. some of my favourite beauty bits. I don't know yet what will be in it or when it will be but it's definitely something that will be done at some stage this year. So I suppose you can keep an eye out for that! These always look like so much fun and I would adore to do one sometime this year as it's such a nice little idea. They are also my favourite kind of posts to read and people always seem to have so much fun doing them and I adore shopping for others especially when it's Beauty related! I try giving up chocolate every year for lent, and I have failed every single time! This year my goals are to finish school and purchase my first ever home! Happy New Year to you! all of these are things that I need to do as well! Especially the better photography one for my blog! Looking forward to more OOTD's! I need to remember twitter chats, I'm so sporadic with them. Lovely idea to set goals to improve your blog as opposed to setting goals that you stand no chance of achieving! Good luck with them! i'm hoping to improve my blog photography as well, i really like the idea that you'd like to do a box swap as well! i'm following you now as well on bloglovin so it'd be great if you checked out my blog as well! I definitely agree about the Twitter chats. 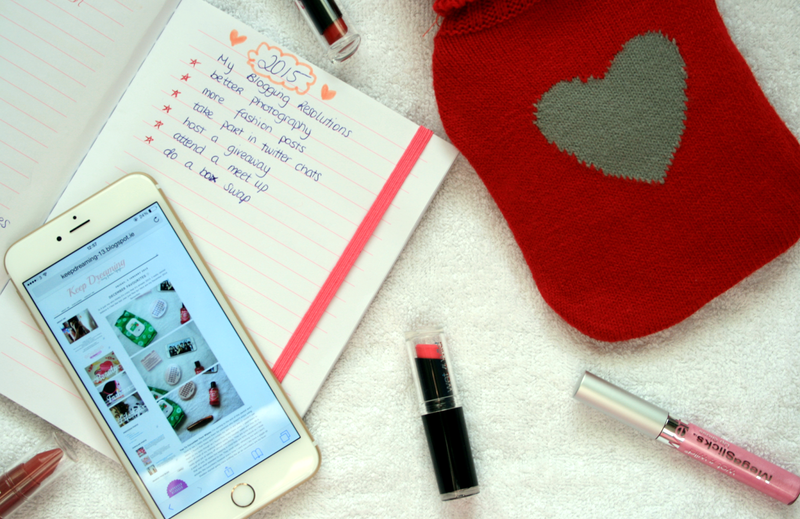 I've been taking part in the for a few months now and they're such a great way to get to know other bloggers! !